I have begun a careful single crystal EPR study of Fe centres in SrTiO3. Fe3+ is a spin 5/2 paramagnetic species. 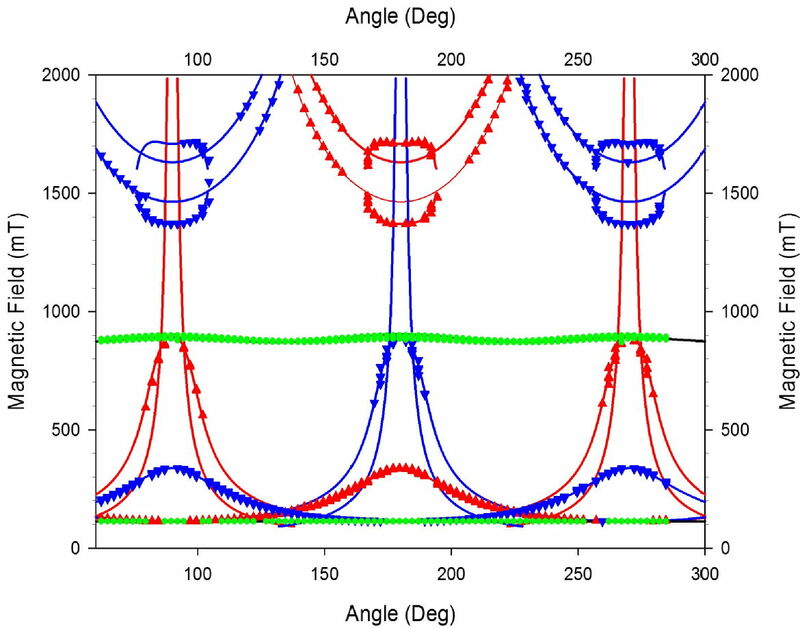 Two Fe3+ centres were identified, one due to Fe-ions substituted at the Ti site in a complete oxygen octahedron, and one due to the Fe-VO nearest neighbour defect complex. The later was strongly anisotropic and exhibits are very large second order zero field splitting. The former is in a perfect cubic environment and has only fouth order ZFS. Measurements of the SrTiO3:Fe crystal at various tempertures has also been carried out. The crystal structure undergoes an antiferrodistortive transition at 110 K, where the structure changes from cubic  to tetragonal  Adjacent octahedra rotate about a common axis in opposite directions, in addition there is a very small elongation of the octahedra along the axis. 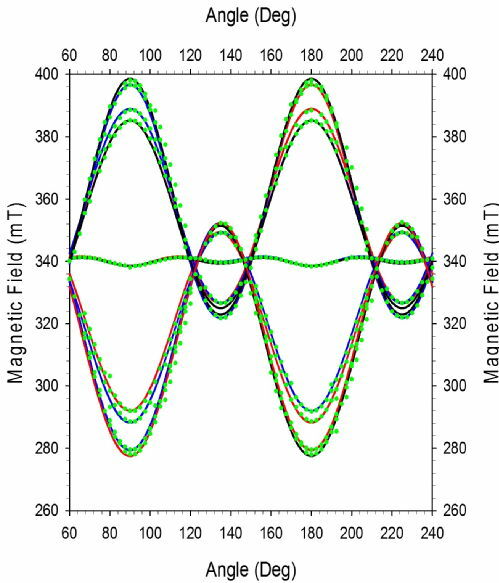 The EPR measurements were carried out at 300 K, 120 K and 80 K.
The SrTiO3 multidomain crystal (with a Iron doping concentration of 0.022%) was placed in the spectrometer so that one of its principle axis was parallel to the rotation axis of the external magentic field, and the other two main axes were parallel to the magnetic field plane of rotation. From this experimental setup, I was able to produce roadmaps for both the Fe3+ centres at the temperatures stated above. The figures show the roadmaps at 80 K.
The data points correspond to experimental data whilst the smooth lines are simulations created using Easyspin. The different colours indicate the three seperate domains with repect to the main axis of the tetragonal distortion that occurs at approx 105 K.
This work is ongoing, I have data at various other temperatures such as 60, 50 and 40 K. I will publish the important results when the analysis is complete.